Although most of the extended Schoenthal family was located in western Pennsylvania during the 1880s, a few family members had moved further east. I’ve already written about Julius Schoenthal and his life and his family in Washington, DC. He was a German and US veteran, a shoemaker, and the father of four children. In the 1880s he and his wife Minnie were busy raising their family. What I had not mentioned in my post about Julius was that by 1879, he was joined in Washington, DC, by his younger (by nine years) brother Nathan. On the 1880 census, Nathan was living in DC, not married, and working as a clerk in a “fancy store.” I am not sure what that is, but according to the Free Dictionary, it is “one where articles of fancy and ornament are sold.” Nathan and Julius were not living in the same enumeration district, and the 1880 census did not provide street addresses, so I don’t know how close together the brothers were living. I don’t know why Nathan left Washington, PA, for Washington, DC, but I would assume that having a brother there was a factor. By 1883, however, Nathan had moved again. He was then living in Richmond, Virginia, working as a salesman, according to the city directory for that year. He was still in Richmond in 1888. According to the 1900 census, Nathan married a woman named Alice in 1890. I have not been able find out very much about Alice except that she was born in South Carolina in 1865. I don’t know her birth name, I don’t know anything about her family, and I don’t know where she married Nathan. Perhaps Alice had been living in Philadelphia; in 1891 and 1892, Nathan appeared in the Philadelphia city directory, working as a “supt,” which I assume means he was a superintendent. But of what? 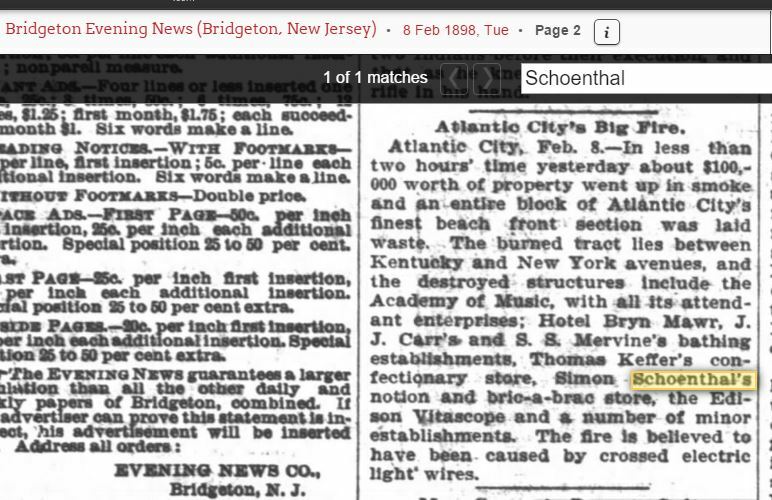 Well, in 1896 Nathan Schoenthal is listed in the directory for Lancaster, Pennsylvania, working as an assistant superintendent for Prudential Insurance Company, so I assume that that is what he was also doing in Philadelphia and perhaps even in Richmond. He is also listed as an insurance agent in the 1898 Lancaster directory. 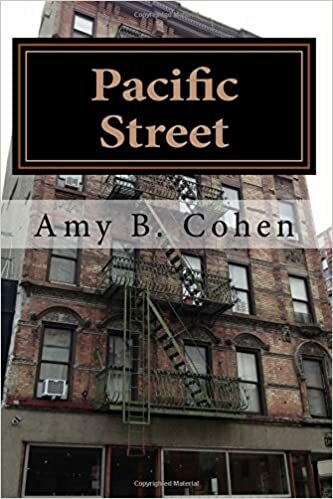 But he was not done moving because in 1900 he and Alice were living in Newport News, Virginia, where Nathan continued to work as an insurance agent. They had been married for ten years, as mentioned above, and had no children. A year later they moved once again, this time to Petersburg, Virginia, a city about 24 miles south of Richmond. According to the 1901 directory for Petersburg, Nathan was now an assistant superintendent for the Insurance Company of Virginia. He was still in that position there in 1905, but in the 1909 directory for Petersburg he is listed as a solicitor without further description. And then in 1910, Nathan Schoenthal is listed in the Baltimore directory as a manager, but I’ve no idea of what. Is it possible that this is not the same Nathan Schoenthal? I don’t know. But this is the last record I have for Nathan. 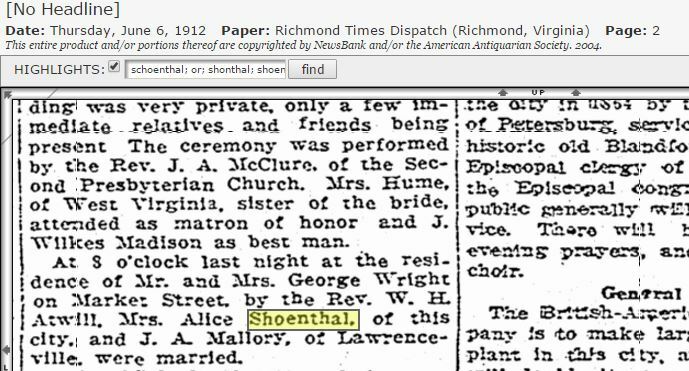 I cannot find him or Alice on the 1910 census, and in June 1912, an “Alice Shoenthal” married a man named John Alexander Mallory in Petersburg, Virginia. Had Nathan died? Had their marriage ended? Had he moved to Baltimore without Alice? Had she finally gotten fed up with moving from place to place? I don’t know. I’ve hit one of those brick walls, and I have no answers. Nathan Schoenthal, a man who moved from place to place and then disappeared, will be in my “To Be Done” folder for a while. The third Schoenthal brother who left western Pennsylvania, in addition to Julius and Nathan, was Simon. Simon had moved to Philadelphia by 1880, where he continued to work as a bookbinder. Unlike his brother Nathan, Simon’s life was remarkably stable and consistent. He was still working as a bookbinder and living in Philadelphia in 1890. The 1880s were productive years at home for Simon and his wife Rose nee Mansbach. By 1880, they’d had five children: twins, Ida and Harry, born in 1873; then Gertrude, born in 1875; Louis, born in 1878, and Maurice, born in 1879, all of whom were born in western Pennsylvania. After that they had five more who were born in Philadelphia: Martin (1881), Jacob (1883), Hettie (1885), Estelle (1888), and Sidney (1891). Rose had been pregnant nine times, almost every other year over almost twenty years. Wow. In 1887, the oldest daughter Ida died from heart disease; she was only fourteen years old. No matter how many children they had, losing the first born daughter Ida must have been devastating for the family. It must have been especially hard for Harry, her twin. By 1890, Simon and Rose had nine children living with them, ranging in age from Harry, who was seventeen, to Sidney, who was an infant. Interestingly, around this time Simon changed occupations. He is listed as selling “segars” in the 1891 and 1892 Philadelphia directories. By 1898, Simon and Rose had relocated to Atlantic City, where Simon now owned a “notion and bric-a-brac store” that was destroyed by a fire on February 7 of that year. 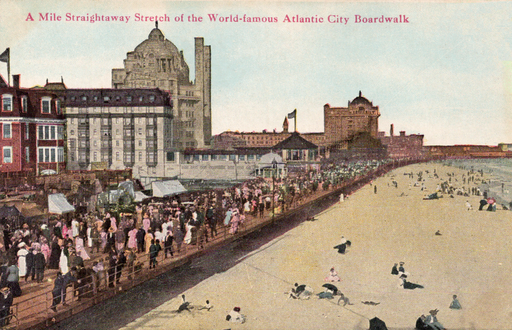 By 1900, however, Simon was back in business in Atlantic City, as reported on the 1900 census. He was then operating a cigar and stationery store. Six of their nine children were living with Rose and Simon: Louis was working as a cigar salesman, and Martin and Jacob were working as “laundrymen.” Hettie, Estelle, and Sidney were also living at home. There were three children missing from Simon and Rose’s Atlantic City household on the 1900 census: Harry, Gertrude, and Maurice. Harry, now 27, was a student at Juniata College in Huntingdon in 1900, as listed on the census. Juniata was at that time a relatively new college, founded in 1876 by the Church of the Brethren, a Protestant sect started in Germany. I would be interested in knowing what drew Harry to Juniata and what classes he took while there. Two years later, Harry was living in Atlantic City where his parents and most of his siblings were living; he was working for Atlantic Wine and Liquor, according to a city directory. As for Simon and Rose’s daughter Gertrude, she had married a man named Jacob J. Miller in Atlantic City on February 12, 1898, when she was 23. Jacob was born in Germany on June 6, 1873, and had immigrated to the US sometime in the 1880s. A year after marrying, Jacob and Gertrude were living in Tucson, Arizona, where Jacob was working for the Crescent Cigar Company, the same industry in which his father-in-law Simon and brother-in-law Louis were engaged. In 1900, they had an infant daughter Juliette and were living in Pima, Arizona. Jacob was working as a grocer. Gertrude and Jacob would have two more children: Harry in 1902 and Sylvester in 1906. Atlantic City directory 1904 Ancestry.com. U.S. City Directories, 1822-1989 [database on-line]. Provo, UT, USA: Ancestry.com Operations, Inc., 2011. All four brothers were living at 22 Delaware Avenue in Atlantic City, their mother at 23 Delaware. It appears that Martin and Jacob were running a laundry called Incomparable Laundry at 1432-1434 Atlantic Avenue and that Louis was running a cigar, tobacco, stationery and sporting goods business at the same location. Louis also listed a billiards and pool hall on “S Virginia av n Beach.” Maurice is listed as a manager at “S Virginia av, Ocean end.” I think that those two addresses are likely the same location and that Maurice was managing the pool hall. As the listings also reveal, Rose was a widow by the time of the 1904 directory’s publication. 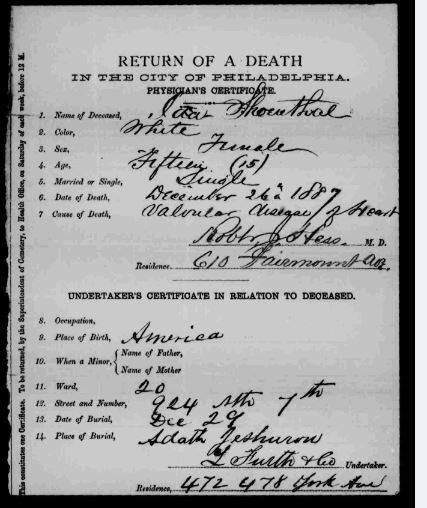 Simon died on March 26, 1904, in Atlantic City; he was buried at Mt. Sinai cemetery in Philadelphia. He was 55 years old and the first of my great-grandfather’s siblings to die. I will follow up with what happened to Simon’s children and other descendants in the 20th century in a later post. This entry was posted in Genealogy, Pennsylvania, Philadelphia, Schoenthal, Washington and tagged Juniata college, Lancaster, Newport News, Pennsylvania, Petersburg, Pittsburgh, Virginia, Western Pennsylvania by Amy. Bookmark the permalink. Could Nathan have been a building superintendent? I wonder if there is some way to search for that info if you knew the building he lived in. I am pretty sure it related to an insurance job since in one directory it says supt Prudential Insurance. But I will look into it–thanks! So you have a great lead! All fascinating! Such contrasting lives within one close family – how different it all was, then. Thank you—I do find following the lives of all my distant and not so distant cousins a lesson not only in history but the nature of family and human beings in general.